Boy, what a couple of weeks, huh? In my day job as a newspaper reporter, I have been wrapped up covering a high profile murder trial since late last month! And then there were those couple of days I was in the hospital! It’s been a crazy time, and it’s cut into my comic reading. A shame really, since we’ve had some good comics in the past few weeks. This week in particular, we’ve got new issues of Batwoman, Squirrel Girl and The Wild Storm, along with debut issues of Generation X and Luke Cage, both of which were highly anticipated by yours truly! And sure enough, the spiritual successor to Power Man and Iron Fist wins Comic Book of the Week for another awesome story by David F. Walker! Meanwhile, in comics I read but didn’t review, Harley Quinn kicked off a fun new story, though I think I’m gonna skip this one. Power Rangers was an interlude issue about Zordon, and was still good. And the second issue of Secret Empire kept the story rolling along, but mostly served to spin-off into the various tie-in titles. All-in-all, a fine week in comics. I even enjoyed the new issue of X-Men Gold, so I may have to try that series again. Comic Reviews: Batwoman #3, Generation X #1, Luke Cage #1, Unbeatable Squirrel Girl #20 and The Wild Storm #4. 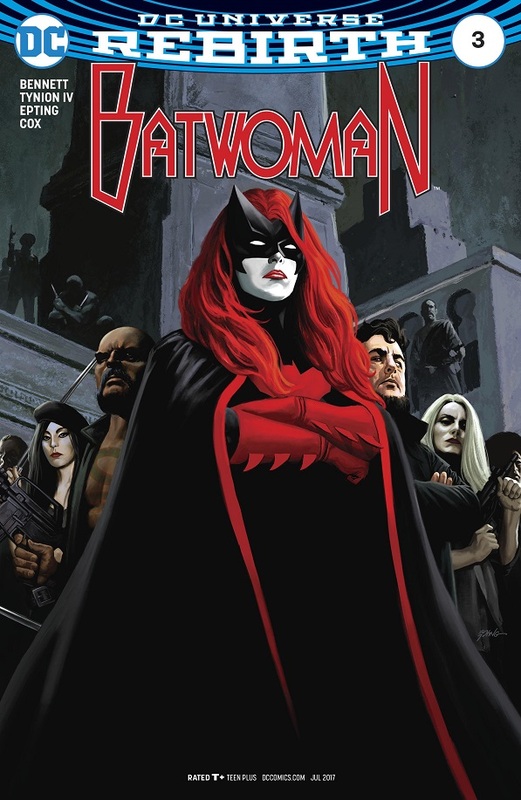 I’m a little disappointed to say that Batwoman has not been a breakout success so far. It’s well written and expertly drawn, but the story hasn’t exactly captured my attention or interest very much so far. Kate Kane goes undercover to meet with the creepy twin leaders of the Kali Corporation. She wants to buy the The Desert Rose bar, and also plant a bug so Julia Pennyworth can hack into Kali’s systems. But Knife is there to attack and the two do battle, until Batwoman is able to escape. Batwoman and Julia then find out that the entire island is rigged to blow, and Batwoman finds one of the cave stashes of explosives. Knife finds her too, but Batwoman’s pirate band is there to back her up. I’m finding the rivalry between Batwoman and Knife to be rather dry. I still want to find out what happened to Kate Kane on this mysterious island all those years ago, but until we get some real meat to that history, the conflicts in the present day aren’t going to be very meaningful. Knife keeps popping up to fight Batwoman but it doesn’t mean anything yet. I’m not invested. And the Kali Corporation is sufficiently weird, but not to any really interesting degree. Plus all this set up has kept us from really digging into Kate Kane/Batwoman as a character. I know we’re only three issues in, but this story is already beginning to feel like a drag, even when it had so much promise. TL;DR: The creative team on the new Batwoman has yet to sell me on their storyline, and the longer they delay the juicy mysteries, the less interested I’m going to be in their new characters and villains. 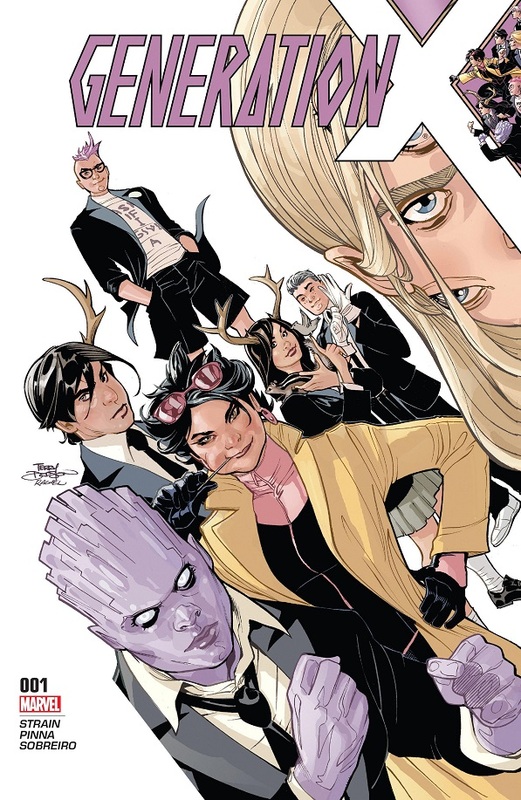 Generation X is one of the series I was most looking forward to in ResurrXion. I never read the original series, but I enjoyed the school-based Wolverine and the X-Men from a few years ago, so I liked the promise of this title. 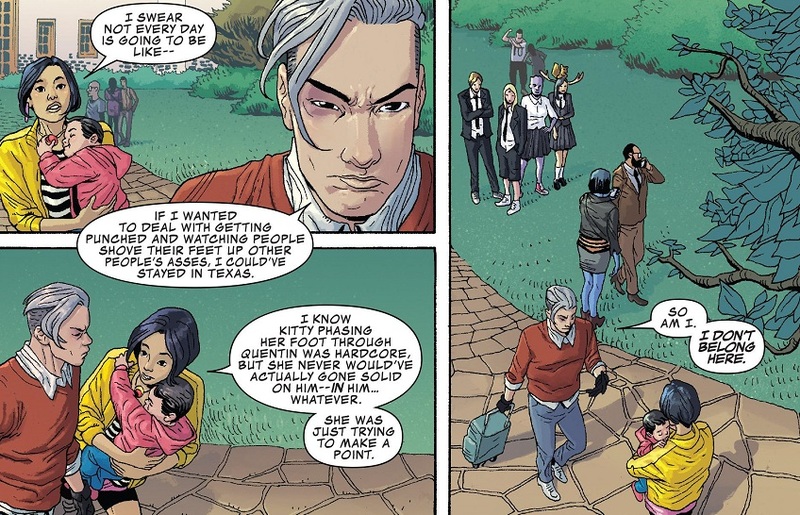 At the new Xavier Institute, Jubilee has signed up as a teacher to help a random assortment of the student-aged X-Men. This includes Quentin Quire, Bling, Nature Girl, Morph, Eye Boy and new character Hindsight, who can read your past by touching you. It’s Hindsight’s first day, and as he walks through the halls, he runs afoul of a fight between Bling and Quentin. All manner of trouble erupts in this hallway scuffle, with the other named students watching. And when it’s done, Hindsight says he’s ready to quit. Jubilee talks Hindsight into staying —and then everybody is attacked by the freakin’ Purifiers. Ugh, that ending really annoyed me. I don’t care for the Purifiers as villains. They’re dangerous, sure, but they’re also painfully one-note. And after spending the issue with a very heavy focus on the grounded, human element of the Xavier School, it felt really stupid to suddenly have a bunch of crazed religious zealots with machine guns show up to slaughter everybody. Honestly, if this new Generation X series kicks off with some kind of mutant massacre, I’m out. That is the last thing the X-Men franchise needs right now. But I didn’t base my score on that ending alone. The entire issue was just…I dunno, not what I was looking for. It didn’t feel organic. Parts of the issue did. I definitely got the feeling that this was a living, breathing campus with a lot going on and a lot of people around. But Strain so clearly and efficiently pushed her chosen roster into the foreground, practically inventing crazy mischief for the sake of crazy mischief. Like, Quentin and Bling just happen to get into a big, hallway destroying fight over a pair of shoes, and then Nature Girl and Eye Guy just happen to be standing nearby watching. And her new character, Hindsight, comes off like an obvious fan-insert. The art, also, is really wonky in places. Good art, but it can get really wonky. Also, Jubilee is still a vampire. Stop it, Marvel. Just stop. TL;DR: The new Generation X has an OK start, but it’s a little too forceful with some of its story choices instead of letting this new world grow more organically. I was quite disappointed when Power Man and Iron Fist came to an end. It was a great comic! 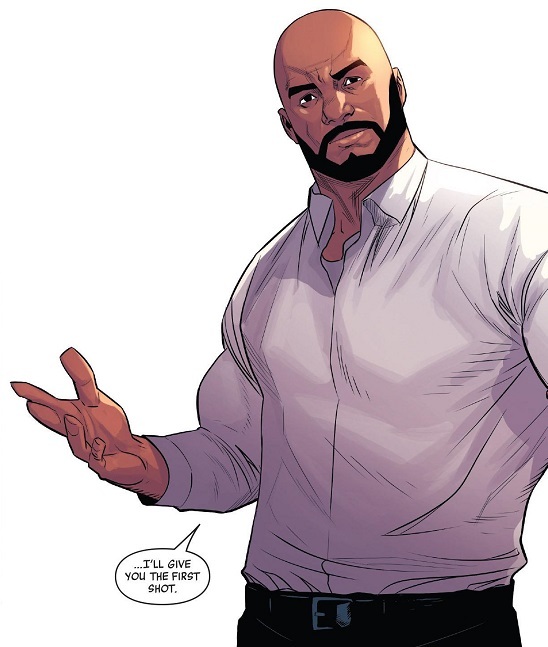 But the new Iron Fist has been pretty good so far, and the first issue of returning writer David F. Walker’s Luke Cage is a resoundingly cool comic! After a badass opening scene where Luke Cage saves a kidnapped girl and takes out a punk criminal, he gets a phone call that Dr. Noah Burstein — the scientist who gave him his powers — has died of an apparent suicide. Luke heads down to New Orleans for the funeral, where he is greeted by Dr. Lenore Mornay, a colleague. Mornay takes Luke to meet Cyril Morgan, a rich guy who helped fund Burstein’s ongoing research after Burstein reversed Cyril’s son’s terminal birth defect. Later, on the drive home, Lenore confides in Luke that she doesn’t think Burstein killed himself. Burstein was working on a lot of different projects and there are more people out there with powers because of him. Their car is then run off the road and Luke is attacked by one such man, with a powerful punch and a blade weapon that can actually cut through Luke’s skin! The bad guys kidnap Lenore and are about to finish off Luke when Mitchell Tanner shows up and saves Luke! Mitchell Tanner is Warhawk, a classic Luke Cage villain who was Burstein’s first experiment. Walker has the attitude of a Luke Cage comic down perfectly. The characters and the world he inhabits feel very real, and I especially loved that opening scene where Cage talks down, then smacks around, the punk criminal to save the kidnapped girl. That was just great. Obviously we lose a bit of that charm by moving to New Orleans and setting up some super-powered slugfests, but the energy and strong character work are still there. Heck, I didn’t even know Warhawk existed until I Googled him after this issue, and already I’m excited to see what Walker has planned for him and Luke. The overall plot isn’t all that original so far, but Walker’s character work is fantastic, so the series is already off to a great start. 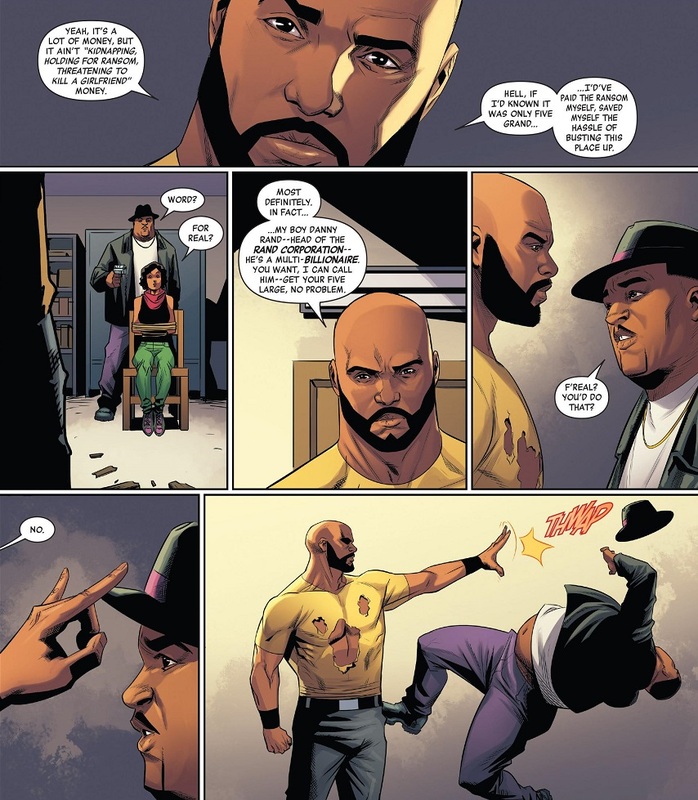 His Luke Cage is just as cool and badass as in the previous comic, and I’m excited to see him do his thing in the new setting with the new mystery. 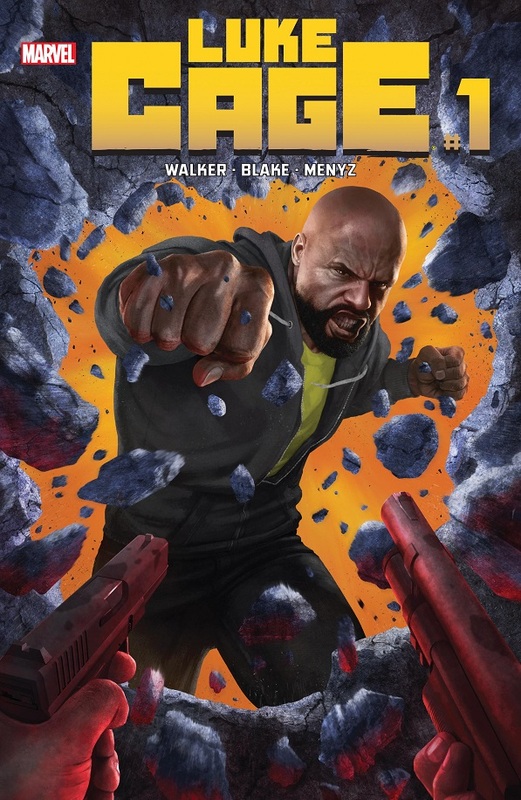 TL;DR: I lament the loss of Walker’s previous comic, but he’s already got Luke Cage firing on all cylinders with its first issue. Stellar character work and a solid, character-focused mystery make for a strong debut. I’m not sure what to say here, other than this whole storyline has felt kind of…I dunno…casual? Just something about Squirrel Girl’s specific and unique spark felt missing. Still, fine story! Melissa Morbeck’s army of mosquitoes are bearing down on Manhattan — but they’re just a ruse. In fact, her whole animal attack is just a ruse, one that includes dressing up a bear in a Doctor Doom costume. Basically, Melissa is framing Squirrel Girl for the animal attack while positioning herself as a hero who can call the animals off. Squirrel Girl is very frustrated at the various levels of Melissa’s framing plan. Squirrel Girl, Chipmunk Hunk and Koi Boi hold off the animals while Nancy, Tippy and a girl I don’t remember build an EMP device to shut down Melissa’s animal control chip. Aaaand that’s that! They turn her over to the police and clean up all the animals. In the epilogue, Melissa is greeted in her cell by Ratatoskr! So we’re probably gonna get some cool villain team-ups! My favorite parts of this issue where the times when Doreen was forced to just grumble at how well-orchestrated Melissa’s plan to frame her seemed. Like, every time Melissa played J. Jonah Jameson and the Fact Channel in her favor, and Squirrel Girl is relatively powerless to ‘fight’ back, it was just plain funny. Beyond that, and I can’t really put my finger on why or how, this just didn’t seem like the usual awesomeness of Squirrel Girl. The story was sufficiently crazy, the jokes were as good as usual and Henderson’s art remains top notch. I guess I just wasn’t feeling it. No harm in that, I suppose. 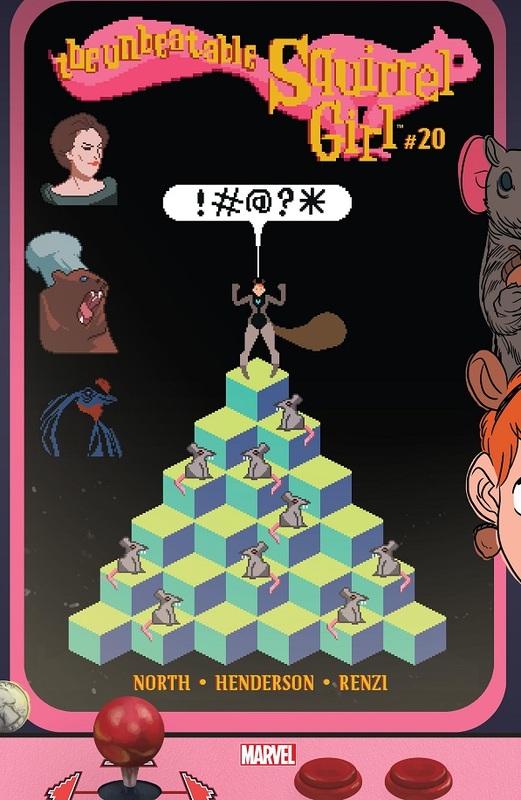 TL;DR: The latest crazy Squirrel Girl caper comes to a close with the usual style, humor and creativity, but something about this issue felt just a touch lifeless. Not sure why. Maybe it’s just me. I said I was sticking with The Wild Storm all the way, and I plan to keep my word. But oy vey, people. Grifter and his wild CAT escape the fustercluck that was last issue’s big fight, as does Angie Spica. She escapes to parts unknown, while Grifter and his team retreat home to lick their wounds. Then…uh…the issue changes into two long chats about recent events. First, the guy in charge of IO touches base with his husband/boyfriend and catches him up on recent events. Then an old man named Henry Bendix has a chat with his secretary, getting himself caught up on recent events. Also, Bendix might be an alien, and he’s definitely working/living on a giant space station orbiting Earth. Both conversations involve a ton of name-dropping and stunted world-building. Also, Michael Cray has a tumor, but he feels fine. Look, this issue was just two separate conversations about basically the same thing: catching up on recent events that we’ve already read. Any new information conveyed in these conversations was awkwardly inserted name-dropping and world-building, for characters, teams, concepts and ideas that I have no clue about. I don’t even know if the fact that Bendix lives on a massive space station is supposed to be a big, shocking reveal or what. Considering the level of technology at play in this series so far, and some of the characters, I would naturally assume such a space station was normal. Is it not? I have no idea! Likewise, I wouldn’t be surprised or shocked of Bendix was some kind of time-traveling alien, or whatever. Even if some of this stuff was a big reveal, it’s meaningless without the proper context. And it’s not like the IO director’s conversation with his husband/boyfriend is any better. He’s basically just reiterating everything that’s happened so far. It’s not interesting and it doesn’t do anything to flesh out the character or the plot. 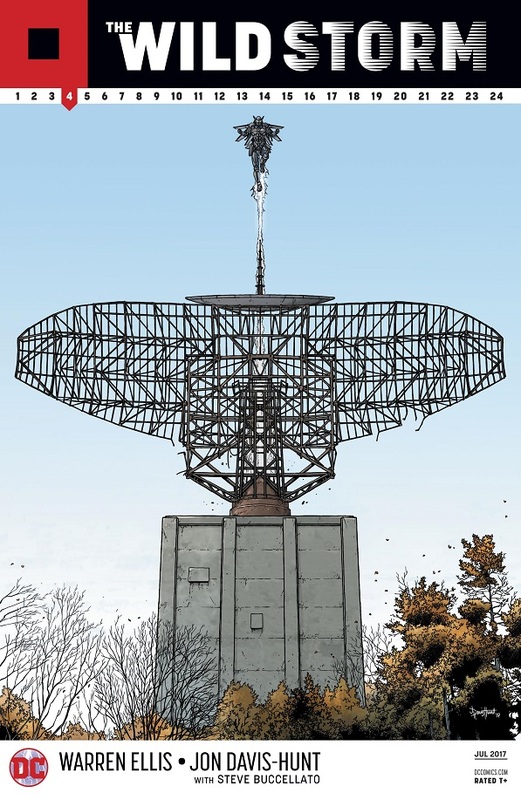 TL;DR: The Wild Storm spends its fourth issue recapping the first three. It feels like it was supposed to be meaningful, but Ellis has done such a shoddy job of world-building that I feel mostly lost whenever he name-drops some other entity in this world. Posted on May 20, 2017, in Comics, DC, Marvel, Reviews, X-Men and tagged Batwoman, Generation X, Luke Cage, Squirrel Girl, The Wild Storm, Unbeatable Squirrel Girl, Wildstorm. Bookmark the permalink. 1 Comment. Generation X was great. Lots of fun, lots of sub-plots being set up. Jubilee is so good here, though of course, she’s so good anywhere, because she’s Jubilee. I’m really pleased with this. Luke Cage was really good. Walker continues to write Luke really well, and he’s got an interesting plot established here. I’m going to make a prediction now: Noah Burstein’s not actually dead. Unbeatable Squirrel Girl is, as always, wonderful. Doombear. DOOMBEAR. And that wedding. Tears, I tell ya. Also, the girl you don’t remember is Mary, from the time travel arc. She is definitely going to be a supervillain some day, but she’ll be a really friendly one.